Even though it wasn't exactly the people's choice, next Saturday's Champions League final promises to be a very entertaining match, especially because the two teams couldn't be more different. Because Chelsea has been thoroughly analysed here, here, here and here, today's article will focus primarily on the German team. While Chelsea have turned into a cohesive defensive unit with a safety-first approach under interim manager Roberto Di Matteo, Bayern Munich's stance is attacking and, as a consequence, their line-up has a clear imbalance in favour of the offense. In fact, it's hard to envision another team that would seem more appropriate (on paper, at least) to Chelsea's newfound defensive solidity. Make no mistake about it: Bayern are a world class team; otherwise, they wouldn't have beaten Real Madrid, Manchester City and Napoli - among others - on their way to the final. As previously mentioned, their strength lies clearly up front, with the likes of Mario Gómez, Franck Ribéry, Arjen Robben and Bastian Schweinsteiger. There are two key aspects to Bayern usual play. First off, Mario Gómez. It's only fair that any analysis kicks off with this unbelievably great poacher. The striker has had an amazing couple of seasons and, were it not for Messi's outwardly feats, would be the competition's top scorer. 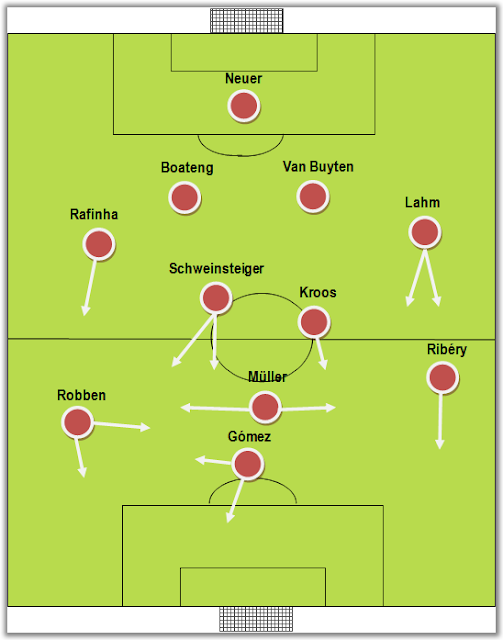 The other aspect are the two wingers, Ribéry and Robben. Both of them are very good on 1v1 situations and can wreak havoc at any given time. Despite their similar nominal position, their movement is very different. Whereas Robben hugs the touchline and tends to drift inward, Ribéry is more keen on dropping back and collecting the ball further back towards the goal line. Bayern are excellent at focussing attention on one wing and exploring the blind side. When Robben drifts inward, Gómez tends to meet him for the one-two, freeing up Ribéry. Similarly to Chelsea, the Germans will line up without key players, such as Alaba, Gustavo and Badstuber - which is to say almost their whole left side. Bayern have been consistently and frighteningly weak down the left wing. For starters, Ribéry has a troublesome tendency to turn off his defensive chip and both Alaba and Gustavo are not the greatest positional masters of defense, opening up the gates repeatedly. Any team facing Bayern know that the left is usually the best way to go. As it turns out, all of these absences might not be that unlucky for Jupp Heynckes, since Lahm will probably have to deputise on the left, with Rafinha taking the right, and Kroos will get back to his natural position beside Schweinsteiger. With Kroos getting pulled back, Müller will probably have to step in as the player in the hole. The thing about Müller is that he has a Jekyll-and-hide football persona, which is not exactly the sort of thing you want for a Champions League final. Apart from that, Bayern's overall defensive positioning leaves much to be desired. Perhaps the presence of Van Buyten is able to bring some much-needed stability to the back four, since Heynckes' men repeat mistakes that every grassroots team is weary of making, such as no defensive coverage and one of the midfielders wandering off. For instance, the German Cup final laid bare their frailties against a simple player partnership such as Kagawa and Lewandowski, which is to say that Mata and Drogba will feel right at home. It's odd that a simple route-one strategy is able to create so many goal-scoring opportunities. All in all, it should be an evenly balanced match, given the Champions League tradition that both teams will be too wary of conceding a goal. Nevertheless, it's this blog's opinion that Chelsea's sober, defensive-minded approach will trump Bayern's attitude of throwing caution to the wind and attacking in numbers - even though it is important to bear in mind that both teams will be missing important players, which may mean that one (or both) of them will find themselves a bit off balance.